Making a batch of Chili Verde takes some effort, but it’s all worth it when you can use the leftovers to make some delicious on-the-fly meals for the rest of the week. These are the quesadillas I’ve been eating for the past few days. Don’t forget that the green sauce is the key to Chili Verde and I usually consider it the most important component of any leftovers. It will still have great flavor a few days after making a batch so be sure to goop it all over your quesadillas. Or burritos. Or tacos. If you missed the recent Chili Verde post you can check it out here. It’s a massively rewarding dish and I usually make it extra saucy so that there’s plenty of green goodness for all sorts of leftover dishes. To re-heat, I usually simmer some of the pork in the sauce for 20 minutes or so over medium-low heat. I also re-season after warming it up. I added a pinch of salt and some Mexican oregano to this batch. If you have bigger chunks of pork you can optionally shred them and stir them back into the sauce. Once the sauce is re-heated the hard part is done. Everything else just becomes a bonus because the flavor of the Chili Verde will do all the heavy lifting. Of course, if you open up the fridge and find a jar of Pickled Onions then you are in luck. 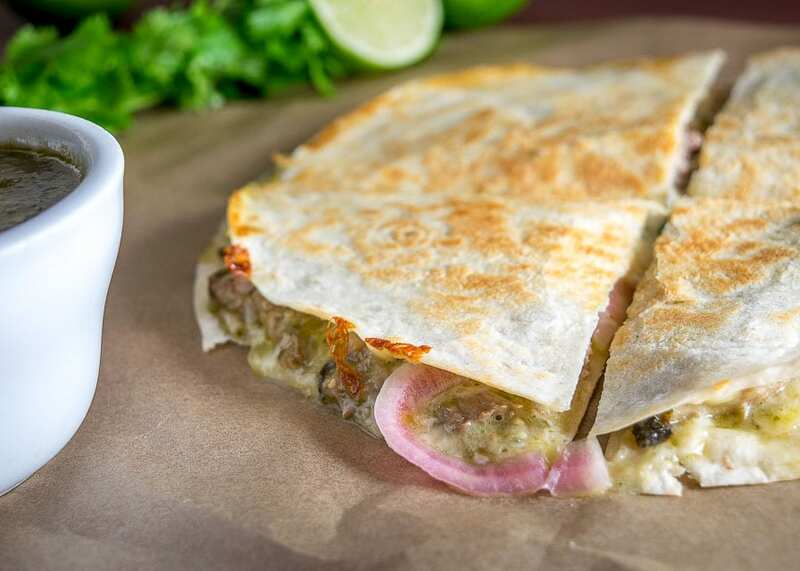 The twang from the Pickled Onions works great in these quesadillas and if you’re new to them then consider making a batch at some point — it’s remarkably easy and they work wonders as a final garnish on tacos, sandwiches, quesadillas, etc. 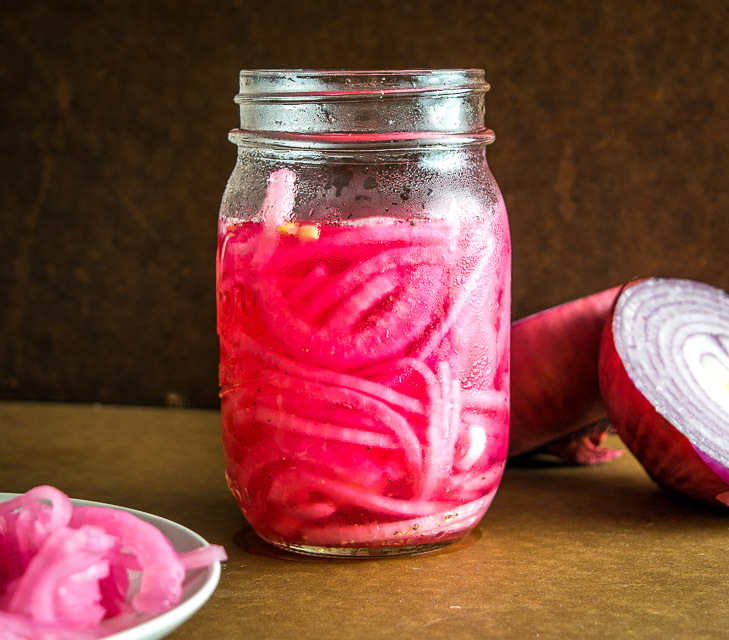 Basically, you are bringing a seasoned vinegar mixture to a boil and pouring it over sliced red onions in a Mason jar. Let this mixture rest overnight in the fridge and tomorrow you’ll have some deliciously tart pickled onions. But don’t forget that you can use them the same day you make them and you’ll still get a decent preview of their potential. 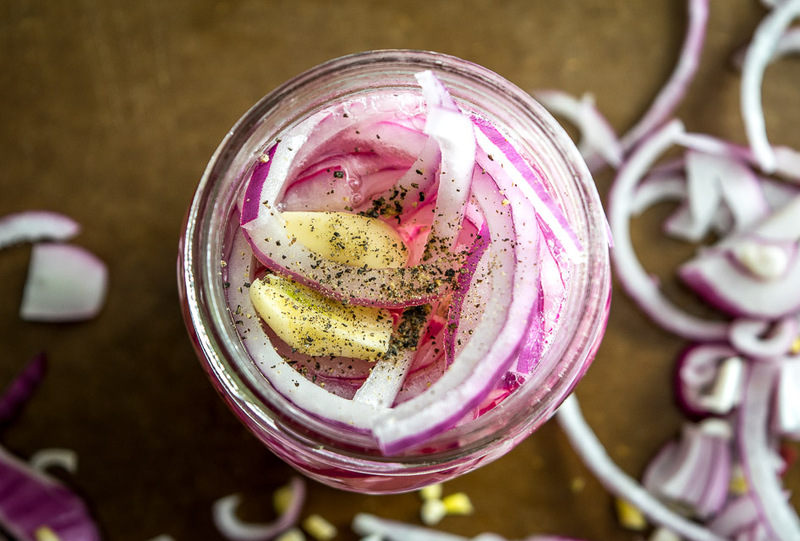 I do this quite often with these onions and with our Pickled Jalapenos — sure, they’ll be fully pickled tomorrow, but they will still taste good today. If interested, click here for full details of the Pickled Onions. For the quesadillas, I usually warm up the flour tortillas before adding ingredients to them — simply plop them in the skillet that you’ll be cooking the quesadillas in for 30-60 seconds (set to medium heat). 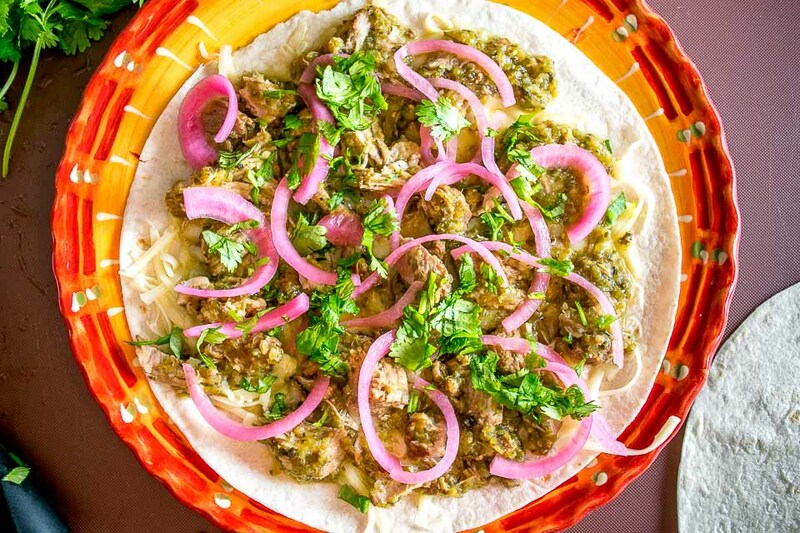 Once the tortillas are warm, put one on a plate and add layers of shredded cheese, Chili Verde, Pickled Onions, and some freshly chopped cilantro. You can optionally add another layer of cheese on top (Jack or Mozzarella works well). Put the other tortilla on top and transfer the quesadilla to the skillet. These will need about 3-5 minutes on each side in a dry skillet until they crisp up and turn golden brown. 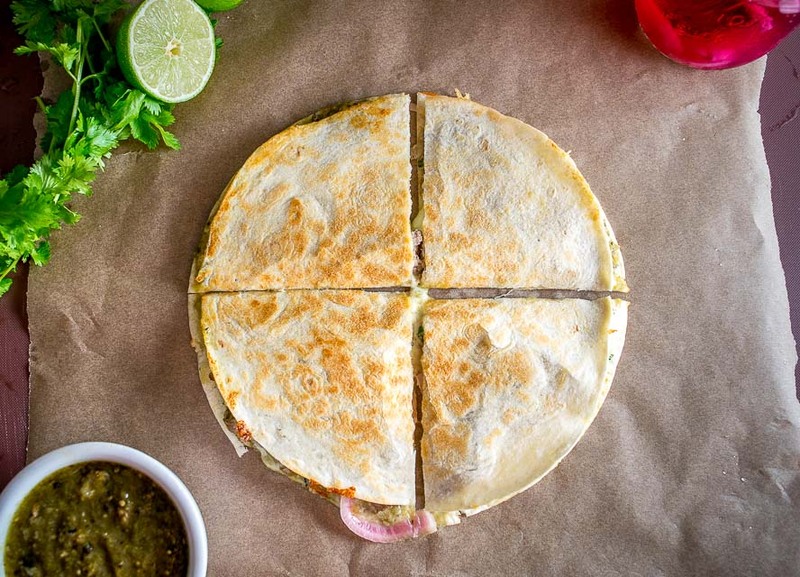 Keep in mind that you’ve got two options for building the quesadillas. When using larger tortillas I think it’s easiest to add ingredients to only half of the quesadilla and then fold it onto itself for cooking. But when using smaller tortillas you lose too much surface area when folding them like that. You can simply use two tortillas to build the quesadillas, as we did here today. If using two tortillas for your quesadilla then you might have some flipping anxiety when the first side is done cooking! No worries though, simply hold a plate face down above the quesadilla and then turn over the plate and skillet at the same time. The quesadilla will end up on the plate and you can slide it back in the skillet to cook the second side. Once it’s golden brown on both sides you can serve it up! 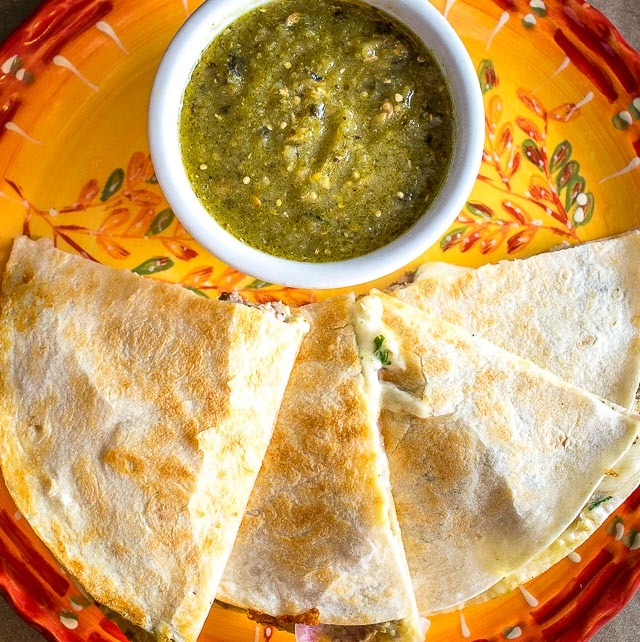 Be sure to include some of the Chili Verde sauce in a bowl on the side — this will give your peeps the option of dipping the crispy quesadilla into the delish sauce. 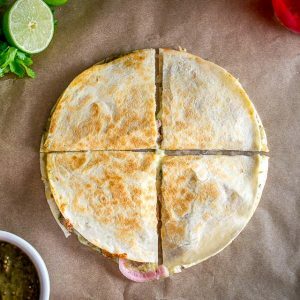 These Pork Chili Verde Quesadillas are a quick meal and they can be remarkably satisfying even if the Chili Verde has been in the fridge for a few days. You can also use a similar flavor profile to make burritos or tacos if that sounds more appealing. As promised, here are the quesadillas I've been making with my leftover Chili Verde. 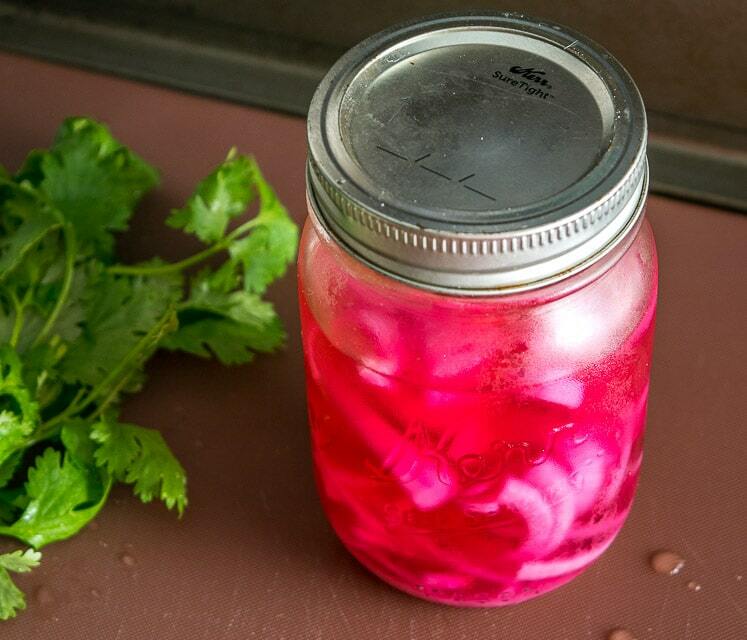 I used some homemade pickled onions for this batch and they are delicious! To reheat the Chili Verde, add it to a saucepan and simmer over medium-low heat for 20-30 minutes. 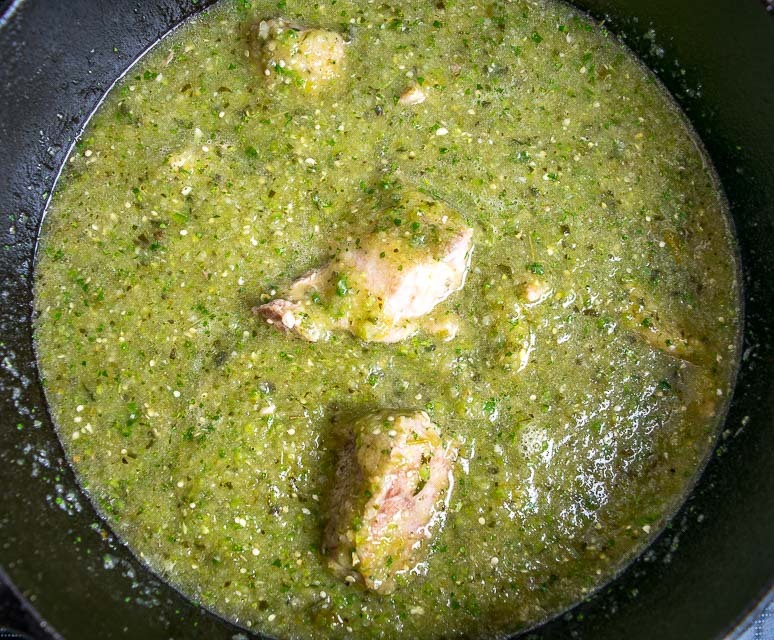 Be sure to simmer plenty of the pork in the Chili Verde. Once re-heated, take a final taste for seasoning. I added another pinch of salt and Mexican oregano to this batch. You can optionally shred the pork and add it back to the sauce if you want. Warm up the flour tortillas in a large, dry skillet over medium heat for 30-60 seconds. Add layers of shredded cheese, Chili Verde, pickled onions, and freshly chopped cilantro. I also add a final layer of shredded cheese on top. Place the other tortilla on top and cook for 3-5 minutes per side or until crispy and golden brown. 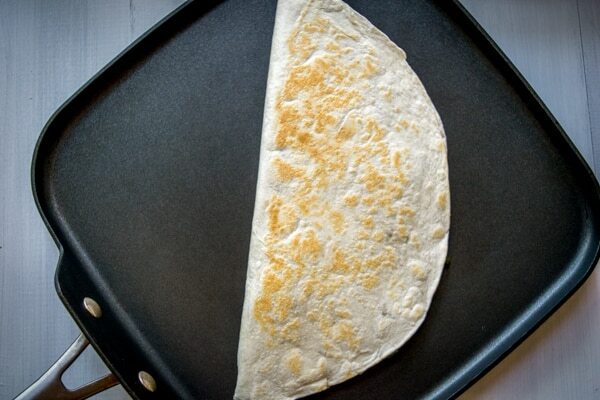 To flip, simply hold a plate face down above the quesadilla and flip the skillet and plate at the same time. The quesadilla will end up on the plate and you can slide it back into the pan to cook the other side. Once cooked, chop into quarters and serve immediately along with a bowl of the Chili Verde sauce for dipping. 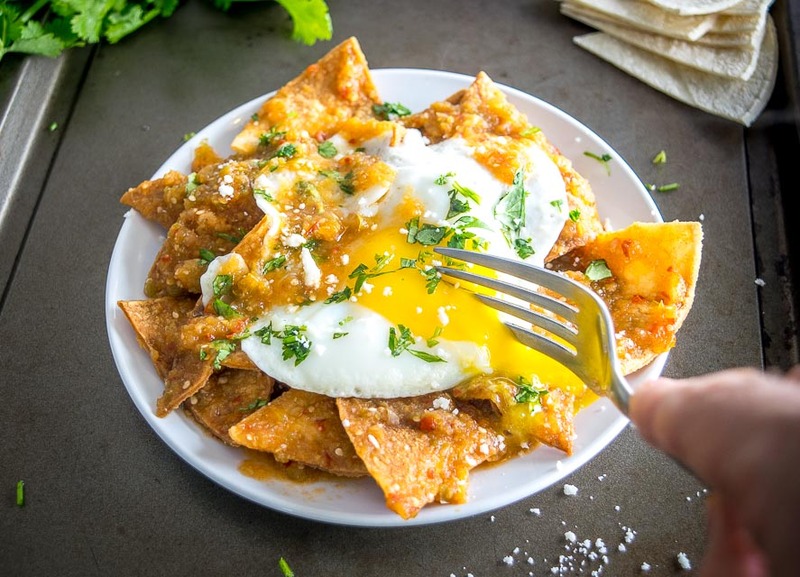 Our latest recipe is Chilaquiles! I love how quickly this comes together if you rely on ingredients you already have on hand. These quesadillas sound wonderful. My cheese of choice would be Oaxaca.